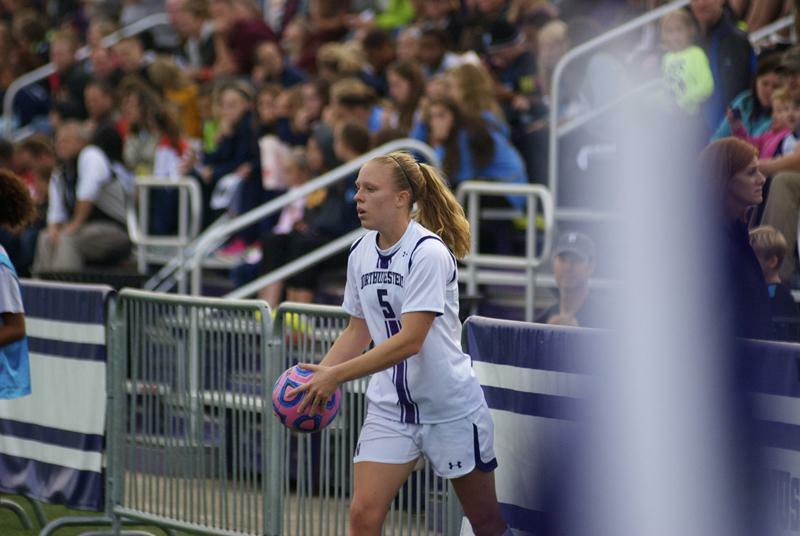 Midfielder Nicole Jewell will be one of the seniors out on the field representing the Wildcats on their senior day and Northwestern’s final homestand this season. Jewell is one of the Cats’ team captains. Northwestern will look to make one final push to the Big Ten Tournament this weekend as Michigan State and No. 10 Michigan travel to Evanston to take on the Wildcats. “We’re mathematically still in it, so we’ve just got to keep fighting and take it one game at a time,” coach Michael Moynihan said. The Wildcats (3-11-2, 1-7-0 Big Ten) currently rank last in the Big Ten with only one conference victory but still have three games left to try to add to that total. Only the top eight teams in the conference make the Big Ten Tournament. Michigan drops by the lake 1 p.m. Sunday on a very special day for the Cats — senior day. “There’s always a little bit of extra energy on senior day,” Moynihan said. Four-year starting forward Kate Allen agrees with her coach. Defeating Michigan, though, will be no easy task. The Wolverines (12-2-1, 6-1-1) currently rank 10th in the nation and are duking it out with Nebraska and Penn State to sit atop the conference. Leading the charge for Michigan is senior forward Nkem Ezurike, who ranks fourth in the Big Ten in goals and assists. “They’re up there at the top and are fighting for that top spot, so they’re gonna come in here pretty hungry,” Moynihan said. NU has struggled recently against teams’ top scorers, allowing hat-tricks to both Illinois’ Jannelle Flaws and Ohio State’s Nichelle Prince. The Cats are in the midst of a two-game losing streak after finally earning their first Big Ten victory. NU, though, has extra incentive to win this one for the seniors. With this season dwindling down, however, the Cats are also looking ahead to the future. The seniors are confident that they leave the team in good hands moving forward and that the best is still to come for this squad. For now, though, this team is just focused on the present: ending the season on a positive note and having fun while doing it. “I’m really just trying to enjoy every moment that I have left,” Jewell said.